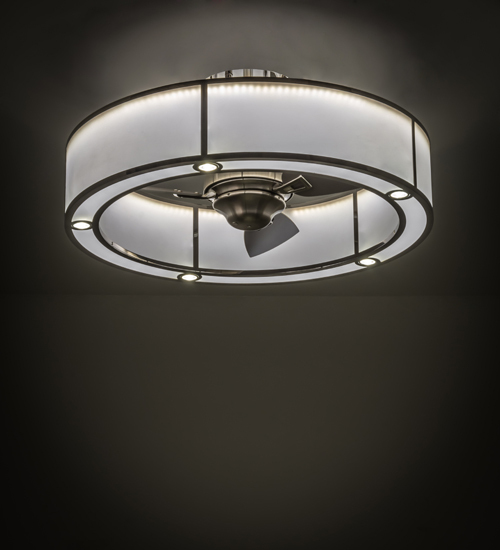 Description: Presenting the ultimate in upscale energy efficient innovations for a home, retail or hospitality location, this masterfully designed and custom crafted Chandel-Air adds luxury and sophistication paired with distinctive custom lighting and fan technology. The Smythe Craftsman Gural is a modern marvel featuring stunning Frosted Crystal Idalight which is complemented with architectural styled hardware highlighted in a Highly Polished Steel finish. Integral LEDs bring out the beauty of Idalight while five 5-watt LED downlights deliver task lighting below. Handcrafted in Yorkville, NY, this Chandel-Air creates a windchill to keep the space cool in the summer, and reversed in winter to push down hot air and maintain warmth. UL and cUL listed.